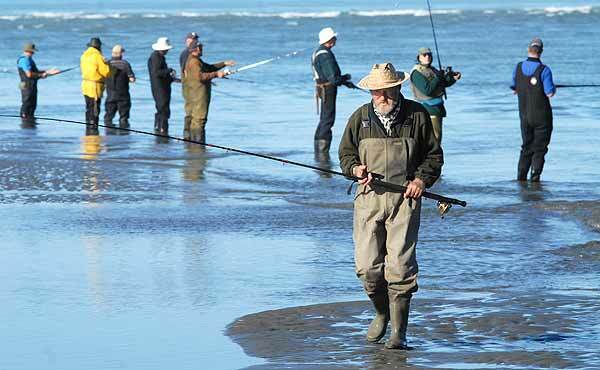 As the tide goes out at the Waimakariri River mouth watch the old experienced anglers as they change their spots every so often, watching the movement of the water and never changing position just because someone down the line caught a fish! As the tide goes out at the Waimakariri River mouth watch the old experienced anglers as they change their spots every so often, watching the movement of the water and never changing position just because someone down the line caught a fish! They know the best fishing water where they have the best chance of taking a fish. When fishing for both salmon and trout, knowing where to find fish is ninety percent of the battle. No matter how good a fisherman you are, the best-presented fly or spinner will not catch fish that are not there. Fish are where you find them, sometimes where you least expect them. One year I took my annual holidays with the first week spent salmon fishing. I made a good start on the first day with a nice salmon in the surf at the Hurunui River mouth. The fish was hooked a few metres away from the crowd that gathers closest to the river pouring into the surf. It was good water where the river forms a hole. The fish was taken just in the first wave right in close. Now luck may have been on my side to catch one of the few fish caught that day. Or was it? I believe it was because I had chosen the right water, therefore making my own luck? How often in a line of a hundred anglers or so, are the salmon caught in one particular spot? Stand and watch the butterfly angler dance around as each fish is caught, changing his position as each fish is landed. Take the Waimakariri River mouth as an example. As the tide goes out watch the old experienced anglers as they change their spots every so often, watching the movement of the water and never moving just because someone down the line caught a fish. Later that week I fished the Rakaia River. I found a promising stretch of water close to the car which is unusual, but on closer examination found there were no leads to entice a fish into this hole, so I moved further downstream a few kilometres. I moved up on an area where the river had previously been and where it now went. At the junction, it left a nice resting place and I fished it for about an hour without any sign of a fish. The river was running at 148 cumecs and was a good colour. Lake Waitaki was very high that summer. Note the trees under water. Just after noon, I had a small salmon of about 10 lb, so I was right, the fish were coming into this spot. Jet boats were passing through and carrying on, so I had this hole to myself. Throughout the afternoon several fish showed themselves, and by 3 o’clock a nice 20 pounder sent me home, a happy man! Being able to read water and putting yourself into a spot where you can best cover the water may lead fish up one side of the river or another. This piece of water meant I needed to fish down and across to get the best coverage. I caught a limit in a season that was proving hard to bag a fish. Learning to read water allows you to decide which areas of a river or lake are most likely to hold fish. With salmon, you are looking for resting water. With trout, there are several reasons for fish being in a certain lie. It could be because the current brings food to the fish or it could provide shelter from strong currents. They could be in these positions anywhere throughout the river, and you have to know where the fish are located. Knowledge of this will prevent a lot of time wasted fishing barren water. A must for reading water is a good pair of Polaroid sunglasses. They must allow you to see into the water and also help you to tell different water depths and spotting weed beds. A river will have the same construction no matter how big or small it is. Pools which have slow deep water provide the best spot to find trout, as the depth of a pool will also give cover and security. I always start fishing at the tail of the pool first, working my way up to the head. What you need to look for are riffles; that part of the stream that comes out of the pool with bubbly fast water. Many fish hold in these areas as the water is deep enough for the fish to sit on the bottom and watch the surface for insects. By working your way upstream fishing these areas as you go, you will not spook any fish that may be moving about searching for food. Fallen logs and boulders produce some good water by breaking up the fast currents. Fish sit in behind for cover and if hooked, use this to good effect in breaking you off. They also make pools and eddies of their own. Lakes are a little harder to read, but a few basics can help in most cases. Back to my holiday and my favourite lake is six feet above normal, clean but high, a good situation for fishing the shallows and flooded areas. Fish will cruise these areas looking for worms and other food washed there by the high water. I chose not to fish the lake and went on to Lake Aviemore, which was a little clearer. A light nor’wester was blowing and I found a spot with a weed bed just offshore and shallow water moving into deep, as the fish would cruise the shoreline looking for food inside the weed bed. Sure enough, along came the first fish, no more than a foot out from the bank. He rose and I missed the strike. A short flick of the rod and he took the nymph. I caught five fish using the same system. There was no random casting. It was a matter of just walking the shore slowly spotting fish. I walked no more than two hundred and fifty yards for those fish, but it took me four hours of fishing, so don’t be in a hurry to get into the water. The next day was a bit cloudy. Like the day before no fish were rising. I managed to raise two fish and caught one. Looking for more water I found a group of willows jutting out into the lake and off the point was a large flat area in which the fish were cruising. 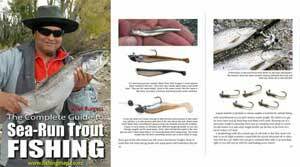 It was about waist deep with weed channels which the trout would use to come onto the flats, cruise the willow lines and head back out to the deep water. You could stand in these areas all day without moving and have all the fishing you wanted. Learn to read your favourite water. Draw a map of it and mark on it the things we have discussed. Also mark where you have seen and caught fish, any changes due to floods, and you will be able to apply this knowledge to any new stream, river or lake. Do it over the winter and be ready for next season. Till next time, good luck!